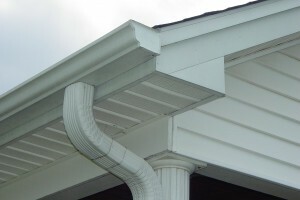 A rain gutter is a basic feature found in practically every house. It is installed just below the eaves and collects rainwater from the roof. It connects to a downspout where water is directed to the ground. Different materials are used to construct gutters San Antonio such as metal and plastic. Metal gutters could be made of aluminum, copper, galvanized steel and specialized metals including copper penny aluminum and lead-coated copper. Broadly speaking, we can categorize gutters as either metal or plastic. Choosing which type of gutter to use in your San Antonio residence could be confusing, so we listed below basic information to assist homeowners in deciding which one is best for their homes. Metal gutters are very durable and strong compared to plastics. They can withstand extreme weather conditions and last a long time. Plastic gutters do not fare well against ultraviolet (UV) light exposure unlike metal ones. They become brittle with time, their rubber seals and brackets weaken and their joints could break resulting to water leakage. Some metal gutter types, such as stainless steel and zinc, could be disassembled and cleaned if necessary. Metal gutters can adopt to fluctuations in temperature better than plastic gutters. They can contract and expand depending on weather conditions unlike plastics, which eventually deform permanently if subjected to repeated extreme temperatures. New technology spawned the seamless metal gutters, which effectively eliminate erosion of screws and bolts on joints. Leakage is no longer an issue. They are flexible compared to metal gutters and do not lose their shapes when bent. Metal gutters, while flexible in a sense, lose their shapes and distort when strong pressure is applied and tend to twist and dent much easier. You can easily modify plastic gutters to suit the design of your home. PVCs, made from molded plastic, are highly adaptable in terms of their colors and shapes. You can order a customized plastic gutter system designed specifically to match the dimensions of your home but it will be priced higher than standard units. PVC gutters cost less than metal gutters and are easier to install. The price of plastic gutters are cheaper than metal ones and their installation costs are also less expensive. DIY practitioners will find these their ideal material. Plastic gutters are also strong like the PVC gutters, which are molded and sold as one continuous unit. They have no issue with corrosion because they have no paint or seams.